Our journey to "Free at 55" – traveling the planet without it costing the world. Our landlord had just suggested that we might only have two months to clear out of our rented home – or perhaps they would be generous and give us four. 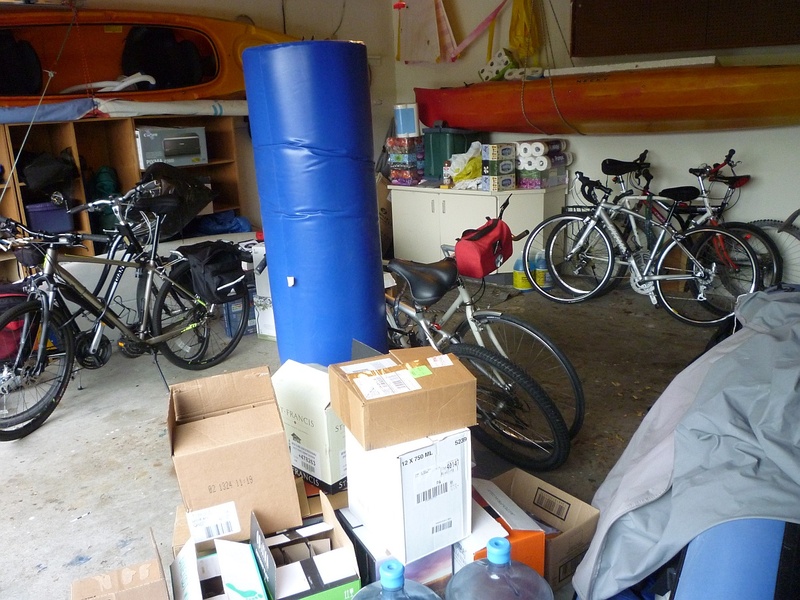 The decluttering project we’d started desultorily was nowhere near complete, and the thought of moving without finishing it was the worst of news. Intellectually, we’d known that decluttering was a precondition to the more mobile lifestyle we were moving towards with “No Pension, Will Travel.” Yet now I looked with dismay at the six or eight half-filled boxes that sat in the shadow of an exercise treadmill that had become a clothes rack. I’d started filling them when my son’s girlfriend had offered to sell stuff on Craigslist for a 50% cut. They broke up over a year ago, and his new love isn’t into online sales. How is all that stuff going to fit into the new place? I felt in my gut the cost of all this stuff. I became exhausted every time I even thought about it. The burden of it all could turn a minor inconvenience into a near catastrophe. We were electrified. We had to get this lifetime accumulation pared down before three months of packing unwanted possessions bit into our upcoming travel plans. The following weeks saw us tackle the project with a vengeance. We mapped out a strategy and dug in. Even when we later received a reprieve in moving for a least the next year, we kept the project going. The cost of our clutter – its clash with our plans and intentions – was now too evident to ignore. In the past few weeks, we’ve delivered a couple of SUV-loads of donations to the local hospice thrift store. Another load went to our younger son who is establishing his first household. We dismantled and recycled the backyard trampoline that had years ago become an oversized hammock. Gone are the cross-country-ski machine that had waiting for a workout for well over a decade and the undersized racing bike that was “just too good to throw out.” There are still six bicycles in the garage for the three of us, not to mention three double kayaks and two treadmills, so we are not done yet. Three double kayaks, two treadmills, and the partridge in the Christmas tree’s in here somewhere. But we are starting to feel energized by the process. There is a surprising liberation in getting rid of something you’ve been unable to part with for years – or even decades. The room that had held our “to be sold” pile for the past year now sports an empty shelf. I feel unexpectedly light every time I see it. While we are nowhere near finished, we’ve climbed aboard the Declutter Express. In case you’re contemplating your own journey, let me share some of the things that have worked for us. We established our vision. The title of this blog captures where we’re headed over the coming years. More travel. Long sojourns overseas without taking more than a couple of suitcases. Downsizing, perhaps with some form of collaborative living. All of these are easier with less stuff. And dreaming about them gives us the willpower to go through that next drawer. The next step was to map our trajectory to that dream. We realized that we were likely to be moving two or three times in the next few years, before we settled longer term. We developed a checklist when undecided about whether to keep something. Would you move it once? Would you move it three times? Would you take it to Spain? Do you want it in your “retirement house?” Would you pay to store it somewhere until then – in a locker with a mouse? Well, when you put it that way! We remembered the best from our past. How many of our most memorable experiences came from our times on the road, with little more than a few changes of clothes to our name. “Remember Costa Rica!” became the family mantra. When the four of us spent six months there, we took four bags – and quickly pared that down to less than two. We traded stuff for experiences, and never looked back. We got more realistic about how this process was going to work for us. This is something very personal, and depends on your disposition, your schedule, and even your income. After waiting for a year for someone else to sell our excess baggage on Craigslist, it was clear that weekly garage sales and want ads were not in our future. Besides, after recently dealing with the estates of both our mothers, we knew how little cash one generally realizes from selling a lifetime’s accumulation. On the other hand, we like to support a number of charities, and many of them make good use of donations in kind as well as cash. Finding good causes to take our excess is a win-win. It took a bit of preparation, but what helped me the most was putting together a list of deserving and willing recipients so I could quickly decide what to donate where. I say “willing” since many charity thrift stores have lengthy lists of things they won’t accept:, including sleeping surfaces, safety equipment, metal furniture, pianos, pool tables, and almost anything electronic, from stereos to phones to PCs. The electronic revolution has had another impact on our clutter problem. 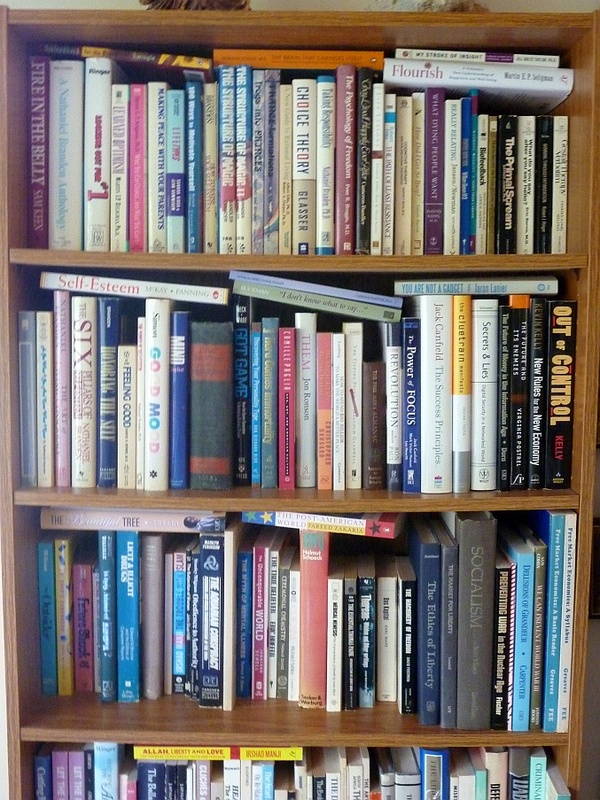 Growing up in the printed era, I had a great love of books – one that Cheryl shared as well. Most of our oldest possessions can now be found stuffed into the towering bookcases that line most of our walls. With a quick look, I could locate books that date back 50 years or more, and some of those were bought second-hand or handed down from my father’s collection. One of my greatest childhood pleasures was exploring the family library which was loaded with fascinating tomes on some of my favourite subjects. As I started to build my own book collection, one of my motivations was to offer that same literary playground to my kids. But they grew up alongside the Internet, home video, and eBooks – making the home library a bit of anachronism. Over the last few years, I’ve finally made the transition myself, and most of my books come on a Kindle, or from the local library. Books may be looking for a new home. Still, paring down that collection lovingly assembled over a lifetime has been a challenge, and it’s been important to find good homes for my “puppies.” Somewhat surprisingly, many places that are still looking for book donations – although absolutely no one wants encyclopedias, National Geographic, or Reader’s Digest abridged classics. So parts of my collection are heading for the local library, the regional library, some private schools, a senior’s facility, a new-immigrant centre, the local hospital, a nearby hospice, a local business collecting book donations for a school overseas – and last week one of the boys asked if he could take some to his new apartment. 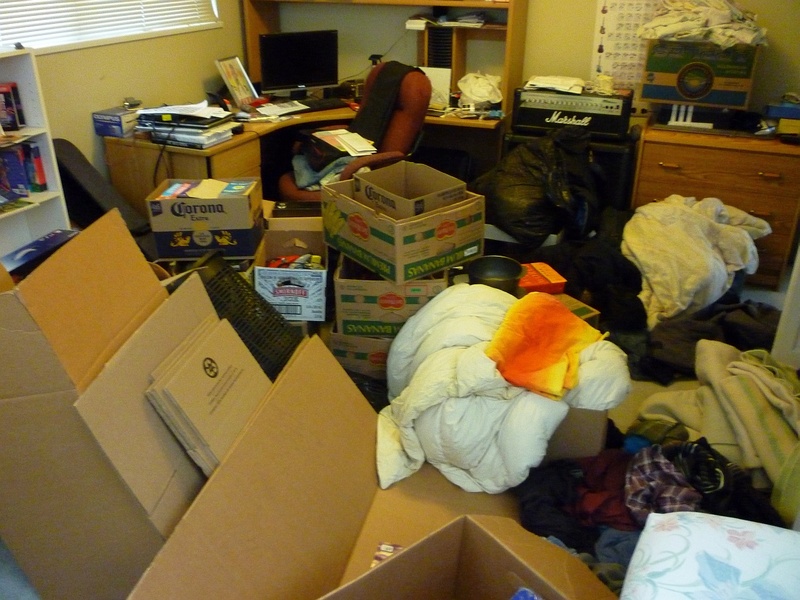 So, we’re making progress, and looking at all our stuff no longer evokes “ultimate suffering.” The process of physical decluttering has led to significant changes on the mental front – I’ll share some of that in our next post. Please add your own decluttering suggestions to the comment section. This entry was posted in Life, Uncategorized and tagged Collaborative Housing, Declutter, Financial independence, Meltdown, Shedding on May 12, 2014 by "No Pension, Will Travel!" with Cheryl + Paul. I think it’s in your genes whether it’s easy or not to get rid of things:)! After living in a trailer for almost a year during our move from Washington to California, and realizing that we can be quite happy with much less “stuff”, it’s interesting to see how/why we accumulate possessions, and to understand how little they really mean. I see every day working with home sellers how hard it is to part with things – so many things have a story and memory, but they mean nothing to any other person. If you have a good friend, my suggestion is to invite her over for a few hours, and ask her what to keep and what to toss. I swear you’ll get rid of things fast that way. Do invite the right friend, though! Thanks, Inge, it sounds like a great idea for when we’ve finished the first pass and our “Declutter Express” becomes a “milk run.” Will keep you posted. With our impending move to Spain, we are in the middle of de-cluttering big time. It has been a challenge but we have empty shelves too and it does feel good to get rid of stuff. It’s the books though; I have hard time getting rid of books. Having Spain as your target – and a date attached? – sure makes this process easier. Yes, those books: maybe we can exchange lists of deserving book recipients? Message me if you’re interested. Loved this. It brought many memories plus all too many current confrontations. Will it never end? And that was a great checklist! It was a bit of a coincidence that I read this article on Zen Habits earlier today: http://zenhabits.net/minimal-kids/. Check it out if you haven’t read it yet! Send me strength! Property ownership is a two-way street. (Think “boat.”) Enjoyed the reads, thanks. My Dad used to say that when he died we were welcome to put all of his stuff into a huge bonfire with no guilt. I think that is a very liberating thing to tell your children. Inevitably the things they will cherish you could never predict… perhaps a wooden spoon you used to make cookies, for example. Did I mention I still have my wedding dress? Thanks, you don’t want to know what we still have! Your comment reminds me that I’m late getting part two up. Lots of travel coming up soon, so I hope I can get to the blog from time to time! This NY Times article reminded me of you. About "No Pension, Will Travel"
Lifestyle. Food. Travel. Writing. Learning in Retirement. Our journey to "Free at 55" - traveling the planet without it costing the world.